Why is film important to students? Digital literacy is an important 21st century skill that today's students should be equipped with in order to be well-rounded citizens of tomorrow. One component of digital literacy is media literacy, as demonstrated through the medium of digital storytelling. The need to both produce and consume media is a reality of today's global culture. There are so many stories to be told through film making, as evidenced not only by Hollywood, but also by the phenomenon of YouTube and reality TV. Everyday people are sharing their lives, thoughts, feelings, struggles, and triumphs. Why not give our students the opportunity to speak through film as well? What is a film challenge? A film challenge is the process through which students learn about elements of effective film making, utilize their skills to communicate their mastery of content, and produce a final film product that touches an authentic audience. As project-based learning and authentic assessments gain momentum due to the implementation of Common Core standards across the country, introducing students to the concept of digital storytelling has become more possible than ever before. For the last six years, I've been implementing film into the core curriculums I teach: Language Arts and Social Studies. While my goal is to help students effectively express their mastery of concepts on film, I think it is also necessary to educate them in what makes a good film through the use of technology mini-lessons. Are film challenges for a specific subject area or grade level? Film challenges can be executed at any grade level, in a video production or media-based class, or in core content areas. The concept of a film challenge transcends grade levels and can adapted for appropriateness given whatever age group you teach. Students editing using iMovie for iPad. Check out the films produced by my students on my Vimeo Channel. Share and enjoy! 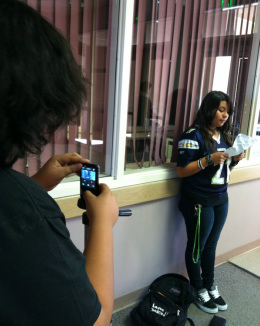 Students filming the award-winning "Spitball Love." Click on the movie-making tab to download a unit plan, see presentations I've given on digital storytelling and advanced movie-making, my favorite movie-making apps for iPad, and more.